Some of the most oppressive regimes, possibly including Iran and Syria, are vying to serve on United Nations' Human Rights Council. 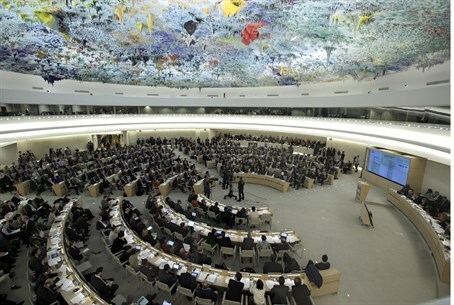 Some of the most oppressive regimes worldwide, possibly including Iran and Syria, are vying to serve on the United Nations' Human Rights Council, Fox News reported. Algeria, Chad, China, Cuba, Russia, Saudi Arabia and Vietnam have all announced plans to run in a November election to fill 14 seats for the 2014-16 period. Iran and Syria also are reportedly considering candidacies. The nations will be bidding to replace council members that now include equally infamous rights violators Pakistan, Venezuela and Kazakhstan, noted Hillel Neuer, executive director of UN Watch, a non-governmental organization based in Geneva. The council consists of 47 United Nations member states which are elected to three-year terms by a majority vote of the General Assembly’s 193 members. The seats are apportioned out by region. UN Watch has previously led successful campaigns to block bids by Syria and Sudan, but most countries win election to the body, Neuer said, according to Fox News. The aforementioned countries are not only unqualified, but should be “in the dock of the accused,” Neuer said.